Continuous improvement is more than a phrase at Precix – it is part of our culture. Come back to this spot in the future for more details on our A.C.E. program. Pictured below are photos of our automated vision inspection machines – Precix is the largest installation in North America of this equipment. Today, we inspect approximately 20 million rings a week through automated vision. This process does more than give our customers zero PPM product – it gives us data to work upstream and further improve our process and products. 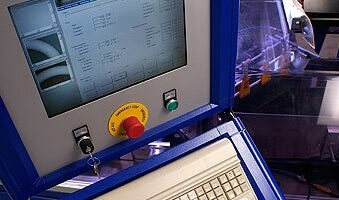 For more information on our capabilities please contact our Manufacturing Engineering department. 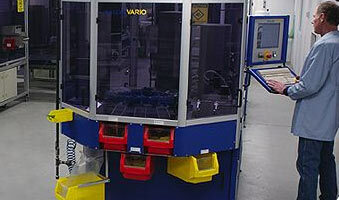 Automated O-ring/Seal sorting area. Based upon what the cameras find good product is sorted from defective. Defective product is also sub-sorted by defect type providing invaluable information to move upstream and improve the process. Data entry/output area. This screen tracks the status of the job and reports on what is being found. 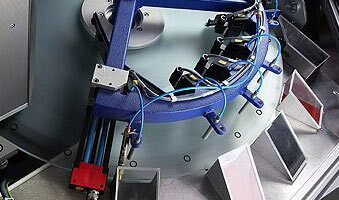 Programming the machines properly is critical to proper defect handling and optimal speed. A picture of the climate-controlled vision room. Environment in this room is kept at a very stable temperature as our production and quality engineers continue to evaluate the performance of all machinery.